Nowadays, anyone can prepare a set full of bangers, but there are very few DJ's who know how to keep the full attention of listeners / dancers dropping heavy bomb after heavy bomb. 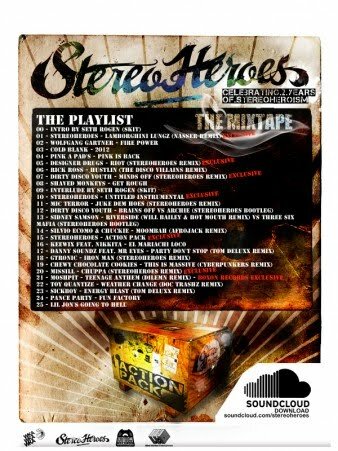 Stereoheroes from France are the absolute champions in this competition. Pumping, powerful, energetic, limbs-twisting frenzy. Funkastic mix with Seth Rogen skits (! )- I want no more. "The concept is easy : Action Pack is a mixtape + A new original track + a World tour. The world tour started already. The track will be released soon and is featured in the mixtape. And what’s interesting us right now, the mixtape. To celebrate our two years of existence we built this mixtape for the people who came to our shows the last few months and were asking for a live recording of our sets, we hope they will find the same energy and diversity in it.